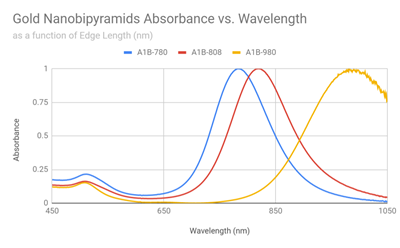 Nanopartz Gold Nanopyramids are pentahedrally faceted gold nanobipyramids manufactured using proprietary methods that result in exact sizes, highly monodisperse sizes and shapes, long shelf lives, high surface reactivity, along with high electromagnetic enhancements for SERS and other Raman. Diameters from 30nm up to 50nm with size accuracies up to 5nm and size variances less than 10%. Peak SPRs range from 780 to 980nm. Every batch is completely characterized including size, monodispersity, aggregation, residual chemicals, and concentration. A Certificate of Analysis (COA) is provided for every order exhibiting TEM and UV-VIS images and data, as well as DLS data. Every product is in stock (99%) and is shipped same day. 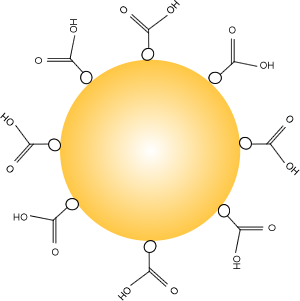 These particles are are available non-covalently capped with CTAB, citrate, and many other adsorbed polymers. These capping agents are readily replaced with covalent and charge chemistries. These particles also come with covalently coupled ligands. 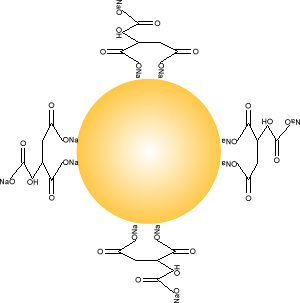 These gold nanopyramids are shipped in DI water with no measurable residual reactants. These particles are not manufactured in citrate. 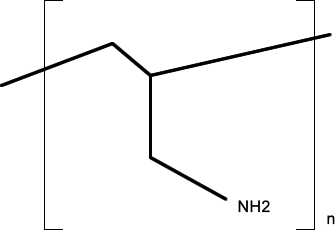 Citrate and the other ligands are functionalized after manufacturing allowing for a minimal, controlled amount of ligand to be used. Diameters 30 to 50nm with SPRs from 780 to 980. Other sizes are special order. Please contact us. This product is available in 5mL volumes and larger. For orders larger than 1L, or for orders amounting over 10L per annum, please contact sales for quantity pricing. Standard sizes are in stock. Special order sizes are shipped in two weeks or less. All domestic shipments are sent Fed Ex Standard Overnight delivery, international Fed Ex Priority 2 day. No shipments on Fridays except for dried particles. Saturday shipping available for extra charge. 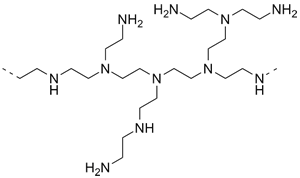 This product comes with different adsorbed ligands: our proprietary carboxylic acid, citrate, and with PEI, PAH, PAA, BSA, and PVP polymers. This product is guaranteed for six months and should be stored at 4 °C after opening. Care must be taken to only use sterile glassware when working with this product. 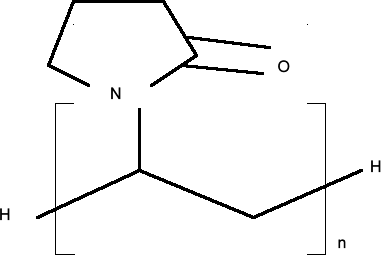 This product is known to be noncytotoxic unless shipped in CTAB. This product has been sterilized and is biological free. How do you size your gold nanoparticles? Does the size include the capping agent? We use three methods to specify our gold nanoparticles; TEM, UV VIS, and DLS. Each has its own advantages and disadvantages, and we use a weighted system to take advantage of each methods strengths. In the end, we place the strongest weight to the TEM method, particularly since we use samples sizes greater than 50 particles for each lot. Do you really provide a TEM for my specific lot? Yes, and not just for 5-10 particles, rather 50-100 are standard. Optical Density (OD) is measured by UV-VIS. An Optical Density OD=1 corresponds to a transmission of 10% through a 1cm cuvette. Optical Density is a nice unit to use since Optical Densities correlate linearly to concentration. So an Optical Density of 1.2 is equal to 1.2 times the concentration of a gold nanoparticle solution that has an Optical Density of 1. We use OD and concentration interchangingly as it is easier to refer to a solution of OD=1 rather than 2.35e12 nanoparticles. For all spheres up to 200nm, OD=1 does refer to 0.05mg/mL. PDI refers to polydispersity index and is equal to the standard deviation of the particle sizes divided by the average size. "We were previously making our own gold nanoparticles using the commonly used technique of citrate reduction of Au(III). The colloids generated are broadly polydisperse, and we were concerned that our application of these particles in immuno-gold labeling of cells for optical coherence microscopy (OCM) would be utilizing only the large diameter tail of the distribution. We purchased the sampler package of NanoPartz gold spheres (30 nm, 50 nm, 70 nm, 90 nm) and examined each size carefully with dynamic light scattering, OCM, and spectrophotometry. Our measurements indicated diameters a couple nanometers larger than specifications (a result of measurements on the fully hydrated state? ), and remarkable monodispersity - within specs. It is clear to us now that our early immuno-gold results were dominated by the largest diameter spheres of our early colloids. We are delighted by the NanoPartz monodisperse preparations and recommend them strongly!" "The scientists at Nanopartz have developed a line of colloidal gold nanorods with extremely high monodispersity in size, shape, and mass. The surfactant layer is highly stable and readily displaced for biofunctionalization. In every test, in vitro and in vivo, these materials have exceeded our expectations." The manufacturing method for these nanoparticles are based on our proprietary method. This invention allowed the first use of a reducing agent to be used at room temperature. Unlike citrate which is only a reducing agent at the boiling temperature of water - thereby quickly making non-monodisperse gold nanoparticles, our reducing agent works by slowing building nanoparticles from seed, atom by atom, over the course of up to hours. 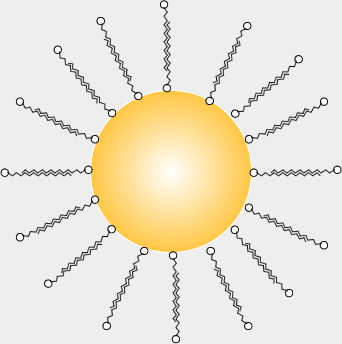 The result is a highly monodisperse product with unrivaled spherical shapes. All of these "bare" particles are capped with ligands that are easily replaced with thiol and charge chemistries. 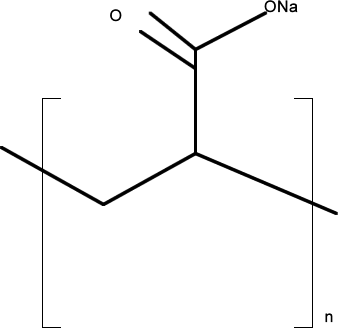 We do not recommend using the carboxyl termination on our proprietary ligand as a conjugatable attachment. Highly accurate and monodisperse in size, shape, and batch to batch uniformity. Monodisperse sizes and shapes leads to better standards for electron microscopy and other diagnostics. Accurate to +/- 5 nm in diameter. More accurate sizing makes for better SPR matching for Surface Enhanced Raman Labels. Size monodispersity better than 10% CV for many sizes. Extremely stable. Shelf life is greater than one year. May be stored at room temperature for extended periods. The light scattering power of a 60 nm gold particle is equivalent to ~5 X 105 fluorescein molecules. Light scatter can be detected by the unaided eye at particle concentrations as low as 10-15 M (femtomolar) in suspension and as low as 0.005 particles/m2 on a transparent surface. 105 better scattering power than fluorescein means lower limits of detection with simpler instrumentation. Individual gold nanoparticles can be seen by eye in an inexpensive student microscope with simple dark field illumination allowing for very sensitive and inexpensive particle counting assays. Different sized particles scatter different colors of light and therefore can be used as multicolor multiplexed labels. Facile conjugations allow for coating of antibodies, receptors, ligands, DNA without affecting their light scattering properties. Slightly negatively charged (reduced aggregation). Facile synthesis. Gold chemistry is well known. 5 - Volume (mL). Other choices are 25mL. CS - Certified Sterilized - Though the product come sterilized, this option includes testing and certification. EP - Endotoxin Purified - The product is endotoxin purified and certified. Ordering by scrolling down and selecting the options from the selection below. Endotoxin Product is Endotoxin purified and then tested for Endotoxin. An Endotoxin Certificate is provided.